Despite a sampling of first-round success, no one from the Pitt women’s tennis team made it through Sunday’s bracket of matches. 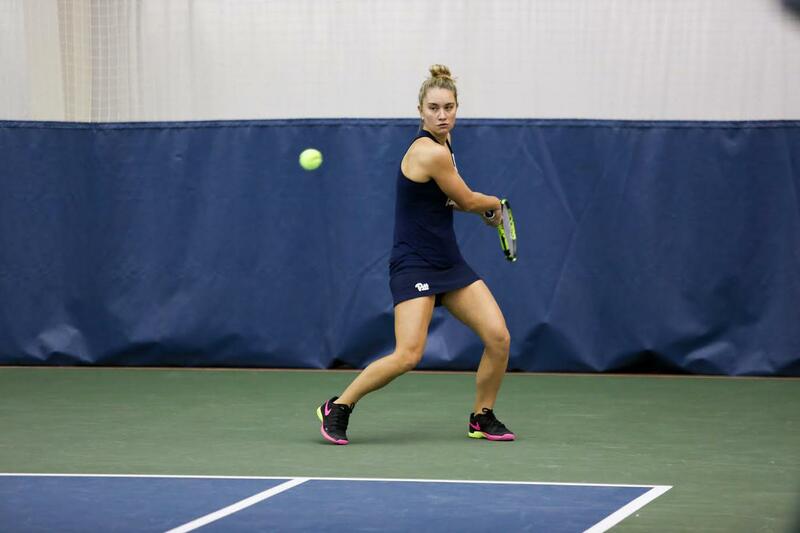 The Pitt women’s tennis team traveled to Blacksburg, Virginia, over the weekend for the ITA Atlantic Regional Championships at Virginia Tech. The Panthers competed in both the singles and doubles categories, with three entries in each of the 64-spot brackets. The action began with the qualifying brackets Friday. Juniors Luisa Varon and Gabriela Rezende both faced Hokie opponents in their opening qualifying singles draws. Varon defeated Hokie sophomore Nancy Ghanem, 6-4, 6-1, before being taken out by James Madison University first year Anna Makarova, 6-1, 4-6, 6-3. Rezende lost to her first opponent, Hokie sophomore Luisa Uscocovich, 3-6, 6-4, 6-4. However, the doubles teams fared slightly better. The duo of Varon and first year Claudia Bartolome recorded an 8-2 win, defeating their Penn State opponents. Pitt senior Callie Frey and first year Camila Moreno followed suit with an 8-5 doubles win over their William & Mary opponents. Pitt’s third doubles unit, Rezende and sophomore Jovana Knezevic, did not make it past the first round, as they suffered an 8-3 defeat at the hands of Marshall University sophomore Brooke Lashway and first year Anna Smith. Only two doubles teams made it through the qualifying round, while three singles competitors moved on to subsequent contests. The main singles draw began Saturday. Only Bartolome advanced to the round of 32, by way of defeating Georgetown junior Risa Nakagawa, 6-2, 2-6, 6-2. Teammates Frey and Moreno were eliminated in the round of 64, each by a College of William & Mary opponent. Frey lost in straight sets and Moreno by scores of 3-6, 7-5 and 6-2. In the doubles tournament, neither remaining duo made it past Saturday. Bartolome and Varon dropped their match against Virginia Tech senior Caroline Daxhelet and sophomore Natalie Novotna, 8-5, while Frey and Moreno were defeated 8-6 by Maryland senior Ekaterina Tour and first-year Eva Alexandrova. These crushing losses left just one Panther in contention — Bartolome. Bartolome competed against Alexandrova in her first singles match Sunday. She started out strong, taking the first set 6-2. But after that win, she faltered. Bartolome dropped the second and third sets by the same score, 6-2, dashing Pitt’s remaining hope of advancing to the finals. Even though Bartolome lost her final match, there were still some Panther matchups to conclude the weekend. Frey, Moreno and Rezende played in consolation matches Sunday. Frey picked up the sole win with a 6-3, 7-5 victory over Liberty junior Anna Dollar. The Panthers’ season draws to a close with their final invitational the weekend of Nov. 3. They will travel to Cambridge, Massachusetts, for the Harvard Invitational.